Need to advertise to passersby or direct visitors to a specific location? These indoor business signs are great for both professional and retail environments. 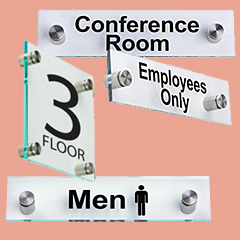 Wayfinding frames are great for informing employees and guests in buildings of any size. Alternatively, the indoor business signs, or interior signboards, can be used as custom name plates outside individual offices, or to designate a specific conference room. These wall and window supplies can also be used to let people know where the fire extinguishers are located. Another use is in museums or galleries, where these indoor business signs can easily let patrons know who painted which picture and a little informational blurb as well. In shops, they can provide instant information, letting patrons know about store specials, new services available, or even simply your updated hours of operation. What styles of interior signboards do we have to offer? 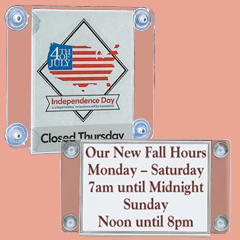 Standoff style indoor business signs, featuring acrylic plates and metal hardware for mounting on a door or a wall. These are great for custom images ranging from 6" x 3" to 11" x 17". 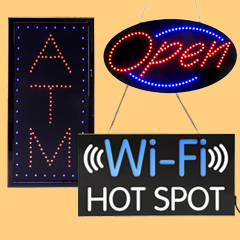 LED displays feature a number of messages, like "OPEN", "ATM", "DRIVE-THRU" and more. These are great for extra visibility when placed in windows. Slide-in holders are made for easy graphic placement and changing. The fixtures are available in a variety of styles, including wall mounts, countertop stands and frames with suction cups for glass. Wayfinding panels for offices are also available in a number styles, either single-sided and mounted to a wall or double-sided and hung from a ceiling or stood off of a vertical surface. 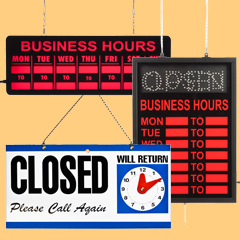 Business signs are available with for showing operational hours and informing customers when staff will return. These come with an LED display and vinyl lettering or an adjustable hand clock. We also offer standalone letters in bright orange or yellow. These come in sets of 132 or 190 and can be used outdoors with their strong vinyl fabrication. 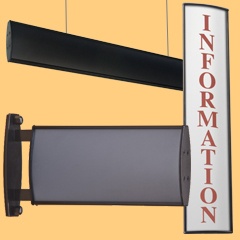 With all of these different interior signboards, any manager or storeowner can find something they need. This business sign making equipment has a number of unique qualities that makes it attractive and user friendly at the same time. Many models feature a heavy duty non-glare lens that shelters custom images from damage. The door and window signs keep graphics encased in rugged acrylic for protection as well. Another useful feature of this sign making equipment is the easy hanging capabilities. What placement options are available with these indoor business signboards? Curved wall frames come with VHB (very high bond) double sided foam tape that is pre-attached to the back. To use, simply peel the protective layer off the tape and affix to a vertical surface. Standoff holders for offices and professional environments use screws and anchors (included with each purchase) to attach the acrylic panels to walls. 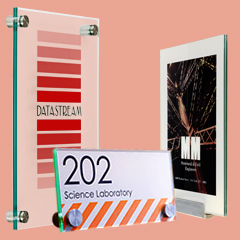 The door signs use suction cups to attach to glass, making them great for easy setup. The vinyl lettering automatically sticks to vertical surfaces. A squeegee should be used to clean the wall to make sure the letters stay attached. Each of the LED displays is made to hang from ceilings or hooks with the included chains. The suction cups and vinyl letters are easy to attach to glass, but here are a few hints to make using the equipment even easier. First, clean the window down with a glass cleaner (like Windex, etc.) instead of soapy water. Soap leaves a film behind that the vinyl has a harder time sticking to. Also, a little bit of lip balm placed inside the suction cup will help them stick even better. Interior signboards are excellent for any user because they feature an easy-to-customize design, requiring only a printer for creating personalized images. Simple paper graphics will look professional in any acrylic indoor business signboard and will last for years in their strong plastic construction. For 1000s of office fixtures and store advertisers, browse online at SignSupplies2go.com!